Nestled nicely in a warehouse area of Berkeley, The Rare Barrel is the definition of a new brewery, having just opened their tasting room in late December 2013 and started brewing in April 2013. 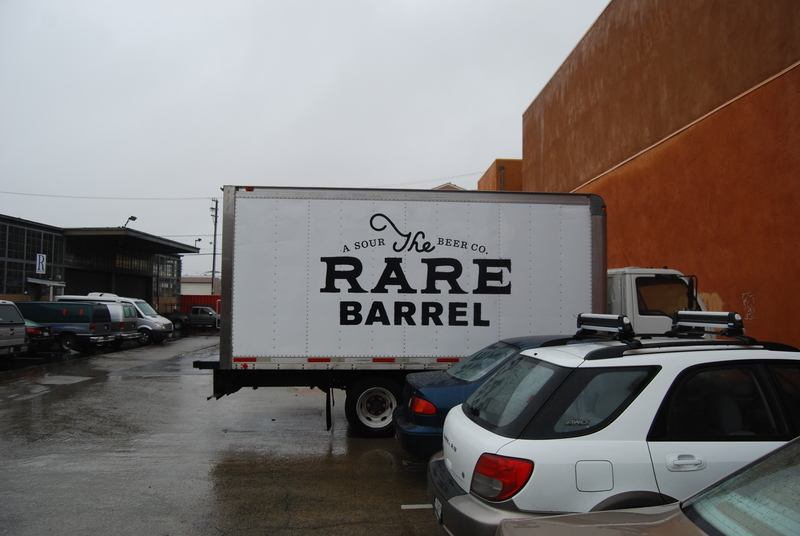 The Rare Barrel focuses exclusively on barrel aged sours, as their name and their tasting room suggest. View from the SKUs Me line. 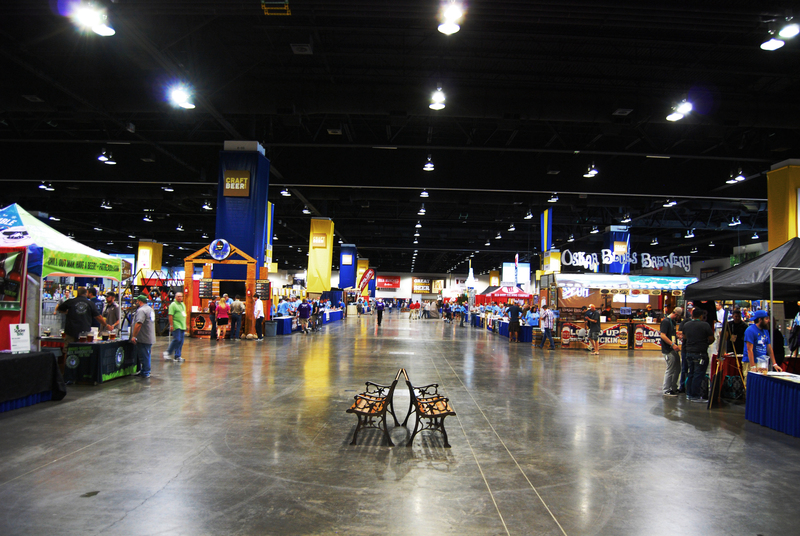 Upon entering, you are met with a cavernous warehouse. To the right are the taps, to the left the bathrooms, and straight back are the numerous barrels, sure to be holding sour goodness waiting to be bottled. 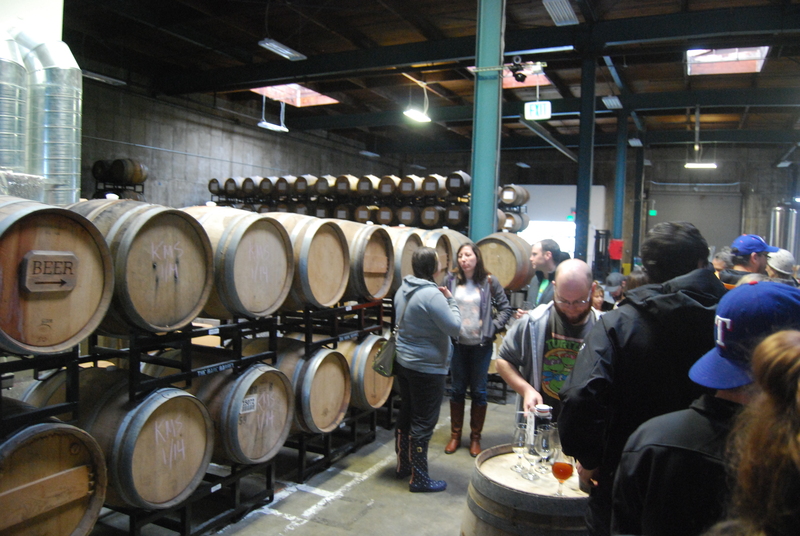 They are only open two days a week (Friday and Saturday), and today was the second day of San Francisco Beer Week and the release of SKUs Me, The Rare Barrel’s first bottle, so the tasting room was most certainly jumping. 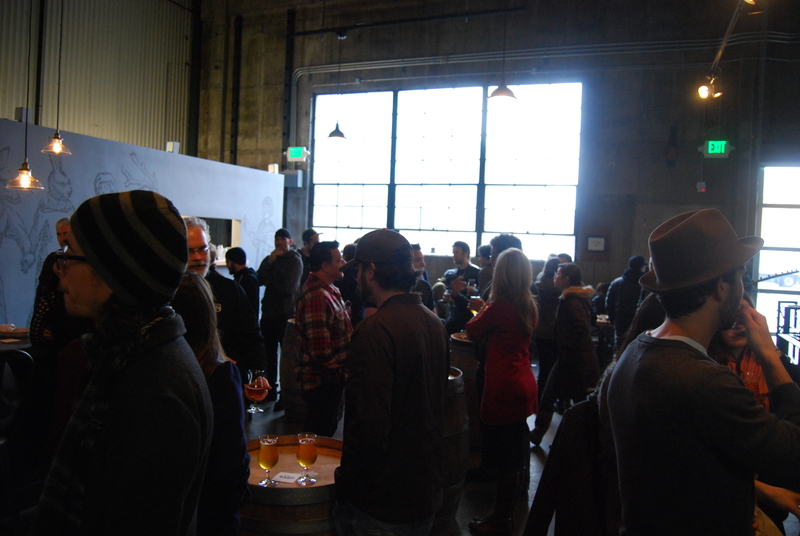 I jumped in line (conveniently right by the bathroom) and struck up a conversation about the Bay Area craft beer scene. About halfway through the line I found the guy I was trading with (who was stationed at one of their barrels, which were tables), which would be a bonus later on. 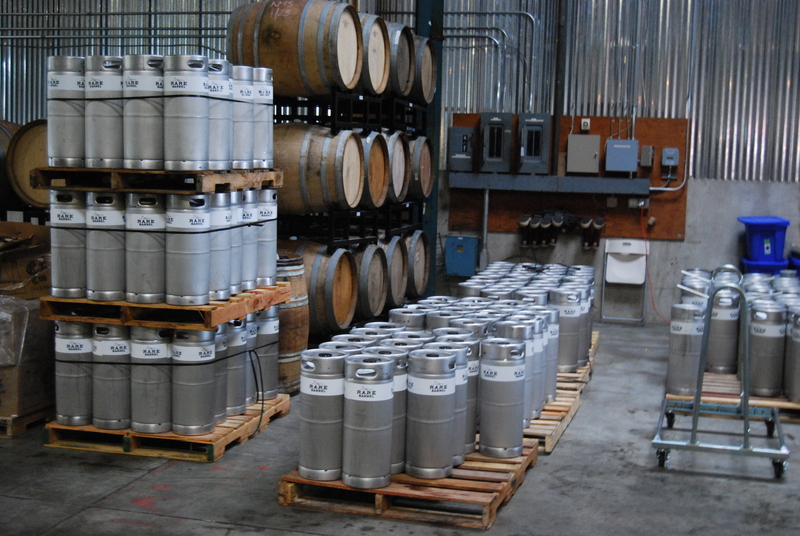 Barrels, barrels, and more barrels. Getting through the line was a snap, as they had three cashiers checking people out and moving the line along. After snagging my bottle, I proceeded to meet my trading buddy at the table. 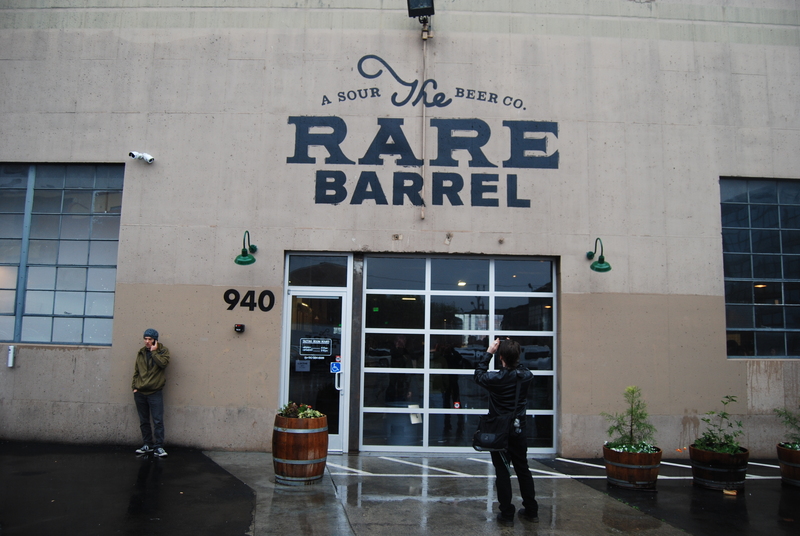 We swapped beers, then started to drink the Rare Barrel’s offerings. There are a few things to note about their beers. As already mentioned, all Rare Barrel beers are sour and barrel aged, most have some fruit in them, and all are dangerously good with a very low ABV. 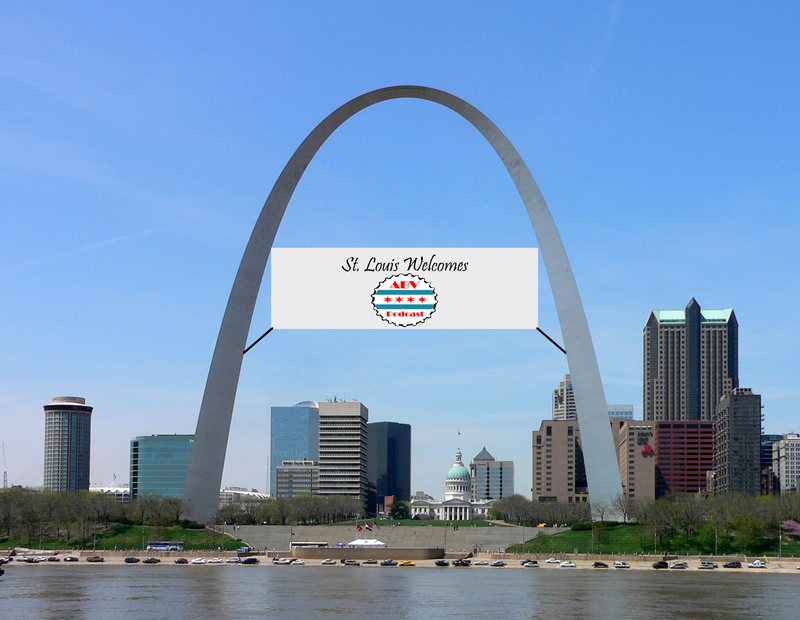 Send a few of those to Chicago, please! Egregious was up first, a dry hopped golden sour (basically a dry hopped SKUs Me), which was good but not mind blowing. Then came the fruit sours: Map of The Sun (golden sour with apricot), Fields Forever (red sour with strawberry), and Sirius Black (golden sour with blackberries). All three were top tier sours, but another one would easily stand above the rest. I perused the tap list, and picked one that I would like to try. My eyes descried Ensorcelled, a dark sour blend with raspberries. The blend was a red sour and a black Brett sour; the blend then sat in a barrel with raspberries. This was a home run for The Rare Barrel. Tart, funky and with a lovely raspberry finish, I wish I was able to drink more of it (and pronounce it; I seem to always want to but an extra c after the s). 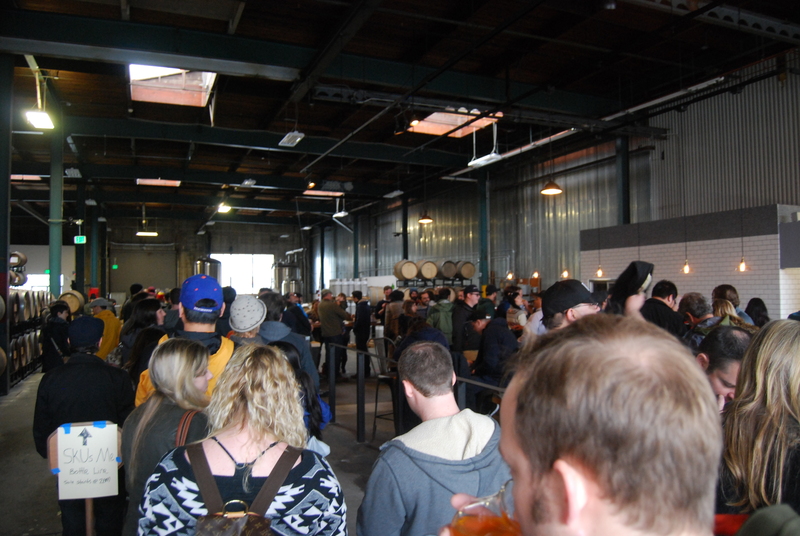 Unfortunately I was slowing down a bit and another beer was being tapped at 4 PM – Batch #1. People enjoying the tap room and release. Batch #1 is the Rare Barrel’s first batch (obviously) that will eventually be used in a traditional gueuze blend (one-, two-, and three-year old lambics). 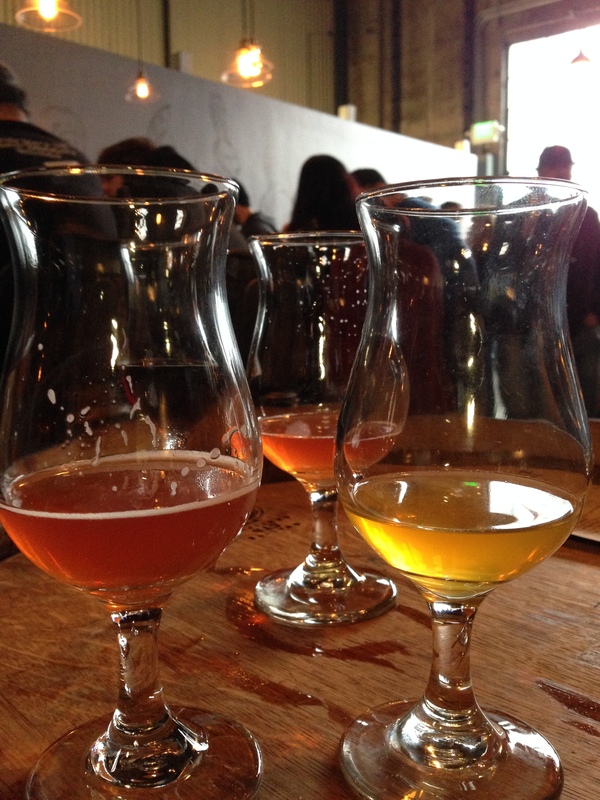 Since it was both San Francisco Beer Week and their first bottle release, they decided to tap a keg of it as a sneak preview. I have no doubt the eventual blend will be astounding (given everything else I was drinking there), but the Batch #1 was easily the lowlight of the Rare Barrel’s beers. It was not bad by any stretch, but everything else was that good. I had met some of my trading buddy’s friends around the barrel table and they were also planning on hitting up City Beer Store for their event. I asked for a ride, they had room, and we were off to the City Beer Store. See ya later, Rare Barrel!